The office is buzzing with activity today as we have a number of big announcements to make. 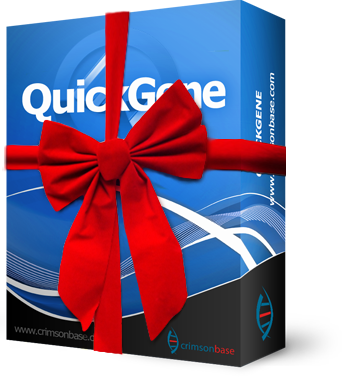 In celebration of the holiday season and today's major update, QuickGene is available for only €50 or $65! That's a €245 or $350 discount and our holiday gift to molecular biologists around the world. Click here to pick it up before the sale ends! Sales are limited to three per person, so give it to your boss, surprise the new grad student and keep one for yourself - everyone loves friendly software! We are proud to present to you the next major expansion of QuickGene's capabilities: alignments! As of today, you can easily align any genetic sequences in a project. Perform both pairwise and multiple alignments. Choose from the ClustalW, Smith-Waterman or Needleman-Wunsch algorithms. Alignments are automatically stored in the current project file. Continue working while an alignment is processed in the background. Quickly spot and navigate to differences throughout the alignment with the intuitive alignment bar. We have much more planned for alignments. As usual, you can expect to see many innovative, time-saving additions in coming updates. We are also happy to announce the long-awaited introduction of QuickGene for Linux. This is currently in a beta-testing stage, so if you are interested in testing on Linux, please don't hesitate to contact us! Naturally, this update has the usual extensive list of improvements, which you can read below. The side-bar is now collapsible to make more space for the sequence view. This particularly increases usability on netbooks. Faster load times for all systems with extra optimizations for multi-core machines. Downloading updates now displays a progress bar. Clicking in the sequence editor to give it focus no longer results in losing a previously made selection. The color of the rulers now also become grey or blue to indicate the focus of the editor. Searching now fully supports RNA and matches DNA without the need to transcribe. Double-clicking projects in the welcome screen no longer causes QuickGene to attempt to open it twice, causing an error. Quickly switching options in the statistics view no longer allows the incorrect enzyme list to display. Activation failure now displays useful error messages. QuickGene will no longer crash due to broken activation. Translations are now displayed correctly in RNA sequences. Fixed various minor memory leaks.